Parallel structured adaptive mesh refinement is a technique for efficient utilization of computational resources. It reduces the computational effort and memory requirements needed for numerical simulation of complex phenomena, described by partial differential equations. Structured adaptive mesh refinement (SAMR) is applied in simulations where the domain is divided into logically rectangular patches, where each patch is discretized with a structured mesh. The purpose of adaptive mesh refinement is to automatically adapt the mesh to the resolution required to epresent important features of the simulated phenomenon in different subdomains. In a parallel computing context, an important consequence of the adaptation is that the dynamically changing resolution leads to a dynamically changing work load, data volume, and communication pattern at run-time. This calls for dynamic load balancing and has implications for data placement as well as parallelization granularity. This chapter gives an overview of structured adaptive mesh refinement approaches. After a brief introductory survey of SAMR techniques and software packages, the main part of the chapter addresses various issues related to implementation of SAMR on parallel computers. In particular programming models, data placement and load balancing are discussed, for shared memory as well as distributed memory platforms. Various approaches and algorithms are presented. The appropriate choice of dynamic load balancing algorithm, data placement strategy, programming model, etc., depends on both the application state and the computer platform. There is no single best alternative under all circumstances. 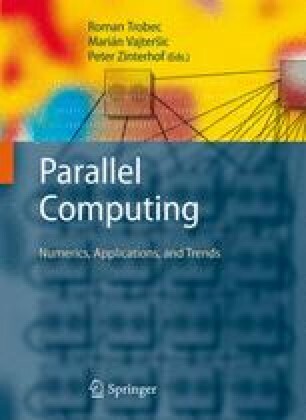 Consequently, the chapter ends with an account of ongoing research where the objective is to equip SAMR-based simulation software with additional adaptivity, e.g., automatic selection of load balancing algorithms and automatic decision about level of parallelization granularity using a hybrid MPI/OpenMP programming model. P. Colella, D. T. Graves, N. D. Keen, T. J. Ligocki, D. F.Martin, P.W. McCorquodale, D. Modiano, P. O. Schwartz, T. D. Sternberg, B. V. Straalen, Chombo software package for AMR applications: Design document, Available at the Chombo website: http://seesar.lbl.gov/ANAG/chombo/ (September 2008). R. D. Hornung, S. Kohn, The SAMRAI homepage, structured adaptive mesh refinement applications infrastructure, http://www.llnl.gov/CASC/SAMRAI/. The Common Component Architechture, http://www.cca-forum.org/.